Queen Elizabeth Pocket Beagles are the recreation of a royal breed, once lost to history. In Medieval times, there was a breed of dog called a Pocket Beagle, which stood 8 to 9 inches. Small enough to fit in a 'pocket', or saddlebag, they rode along on the hunt. 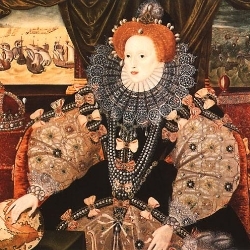 Queen Elizabeth I often entertained guest at her royal table by letting her Pocket Beagles cavort amid their plates and cups. This type of beagle is unfortunately extinct, it's genetic lines lost forever, its heritage left to the imagination. UNTIL NOW......the Queen Elizabeth Pocket Beagle Foundation has recreated that much desired little dog breed. While careful to preserve its inherently beagle nature we miniaturized its big beagle size, making a Queen Elizabeth Pocket Beagle the perfect fit for most peoples' busy urban lifestyle. A Queens Beagle is versatile as your companion road mate, cuddly couch potato, or warm bed buddy. They just want to be with you. Queen Elizabeth Pocket Beagles are the smallest rare breed hound in existence. Queens Elizabeth Pocket Beagles mature in two sizes ranging from 5 to 15 lb. as teacups, to 15 to 25 lbs. as toys. This is significantly smaller than the standard beagles' size of 25 to 50 lbs. Puppies come in a wonderful array of colors and patterns, some never before seen in the realm of beagles. Queen Elizabeth Pocket Beagles characteristics merge the best of both worlds. The Queen Elizabeth Pocket Beagle compares to a standard Beagle as an Italian Greyhound is similar to it's larger racing counterpart. While some Queen Elizabeth Pocket Beagles are used for moderate hunting, agility, and lure coursing the breed is intended to be a beloved pet. This little beagle has more love for people than for 'the chase'. A lower prey drive, a calmer nature, increases its response to positive training. Demonstrating intelligence and intuition nonparallel to its canine contemporaries, the Queen Elizabeth Pocket Beagle has a sensitive nature and is adoringly devoted to its family. They seem to know what you want and house train easily. They can get most of their exercise needs within the walls of your home. Queens' Beagles typically recall easier from exploration than a standard beagle. Great for living in town or apartment, they are not as vocal as a standard beagle. Easy to maintain, they rarely need grooming or the attention of a veterinarian. Deriving health from a wider gene pool than the standard beagle our miniature breed has demonstrated less predisposition to genetic defects. Queen Elizabeth Pocket Beagles come with a one year health warranty. A beagle is the all-American icon of a 'boy's dog' and a Queen Elizabeth Pocket Beagle loves children and other animals. 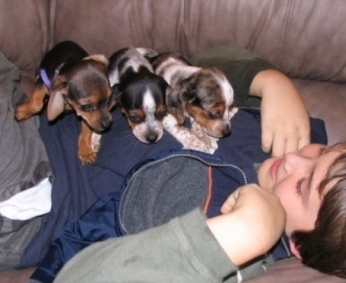 Your beagle's attention will forever center on you, as 'king' of your little Queen's world.